Self-service BI is about allowing the user to decide how to best show the data relevant to the problem they are trying to solve. Design trends are like a pendulum moving towards and away from ideas over time. When a concept is taken to its extreme it ultimately becomes rejected by some, who react against it and begin to create work in opposition to this extreme. Over time others follow and eventually when that idea hits critical mass a new extreme is thought of and the pendulum of what is popular swings away to a new direction. In the early 20th century in American and Europe people began to reject the established social hierarchy, there was a blurring of social boundaries, and artists turned away from established schools of thought. People wanted new ways of thinking that better reflected the times they were living in. This was the birth of Modernism. In some ways Modernism was successful, but eventually like any movement over time people reacted and moved away from Modernism creating Post-Modernism. Post-Modernism built off of Modernism but it rejected the idea that “qualified professionals” knew the best way for everyone. It was a rejection of "one size fits all" design solutions, where everyone should design and think the same way. A homogeneous design utopia isn’t possible. In design, this sort of thinking is limiting, artificial, and is ultimately rejected. Post-Modernism embraced difference, that there are multiple ways to come to the same truth - to answer the same question. 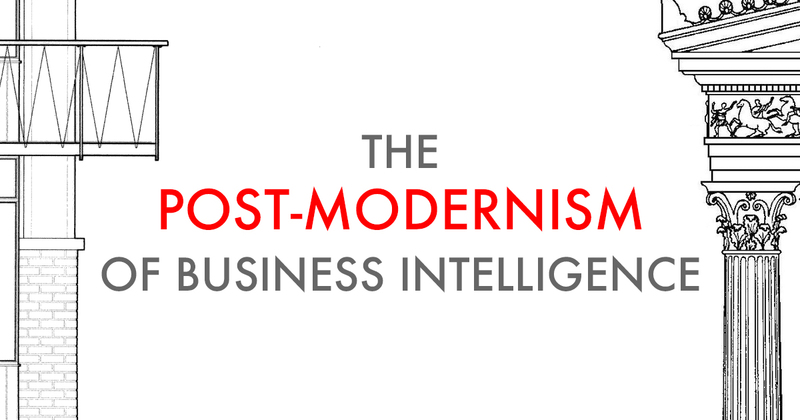 Modern business intelligence has its start in spreadsheets, and lots of them. There were technical limitations to how one’s data could be shown but like the Modernist movement, there were (and are still) people thinking their view is the authoritatively correct view and prescribe it to others. This idea that there is only a single version of the truth in how to arrange the data is outdated. How I want to arrange objects for my data analysis might not work for you and that’s OK. This Post-Modernist approach says that individuality & diversity is not only accepted but encouraged and it’s the direction BI is moving. Self-service, or autonomous BI, is about allowing the user to decide how to best show the data relevant to the problem they are trying to solve. The world of data analysis is moving into a world very different from the past. New forms of software are certainly a large part of this, but the ability for users to arrange and explore the data in a manner that works best for them is where we are headed. The pendulum is swinging away from the top-down model of being handed the tool to use. You are still solving the same problems but how you do it is up to you. If you are on the design side, creating apps for others to use, you should embrace that different users will use your app in different ways. There are no wrong methods just wrong answers.